June 13, 2010, filed under Fiji; 2 Comments. 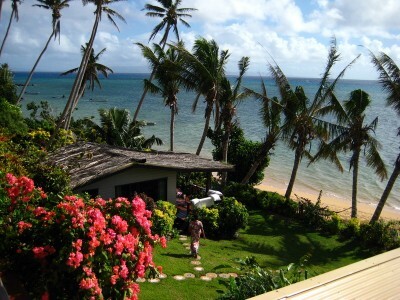 We arrived at Bibi’s Hideaway on June 1, 2010 a few months after the devastating Cyclone Tomas. The estate was beautiful, but the signs of the hurricane were obvious. Thirty foot palm trees littered the lawn and large bushes were half uprooted and struggling to stay green. The bures appeared to be in perfect condition and I read the reefs around the island sustained only minor damage. Unfortunately the high winds had knocked down all of the fruit, so we wouldn’t be able to pick our breakfast from the numerous fruit trees located on the property. 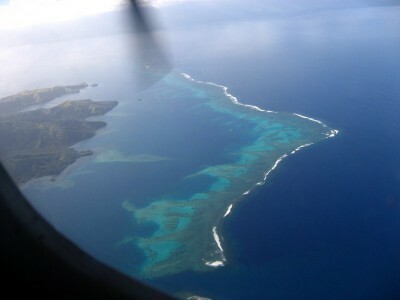 A change in flight times had us land in Taveuni around 8:00 AM, four hours before we were expected. Paulina, the caretaker at Bibi’s, welcomed us with a smile and showed us to the large white cottage. We had reserved the Honeymoon Bure, but as guest has just checked out that morning it wasn’t read for us. 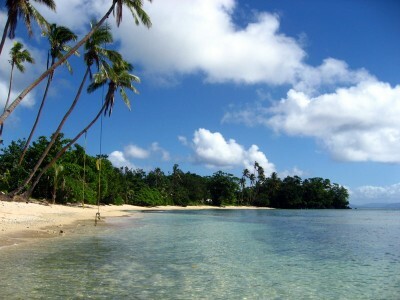 Paulina assured us that we had full use of the other cottage, we could shower, cook or nap until our bure was cleaned. We didn’t want to create more work for her by dirtying the cottage, so we decided to walk over to Coconut Gove for Breakfast. We were a little worried we had missed it during our walk, as it was slightly farther than we had expected, but once you are familiar with the area you realize it is a short walk. Coconut Grove’s restaurant is located on the second floor of the resort with an excellent view of the ocean. Coconut Grove is a small resort, with only a few bures and a small restaurant. They also sell a few things in the reception area, some pearls, sarongs and postcards. People rave about the cooking at coconut grove, but I’ve only tried the fruit shakes and the grilled cheese. 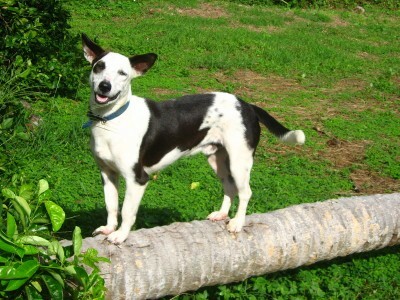 The weather was perfect – warm air, lots of sun and a cool breeze. We spent the afternoon walking on the beach and dipping into the ocean to cool off. The water is crystal clear and unlike so many beaches I’ve visited I didn’t see a single piece of trash floating in the water. On our way back from the beach we ran into the Indian man who lives next door to Bibi’s and provides dinner to the guest. We were so excited to have dinner delivered for only $10 Fijian! He knocked on our door at about 7pm with two warm plates of chicken curry, some dahl soup, and a pumpkin side dish all over rice. The dinner was delicious! It wasn’t spicy, but it was so flavorful! I haven’t eaten much Indian food, and Paul’s had it even less frequently than I have, so coming here and eating it all the time has been a real treat. 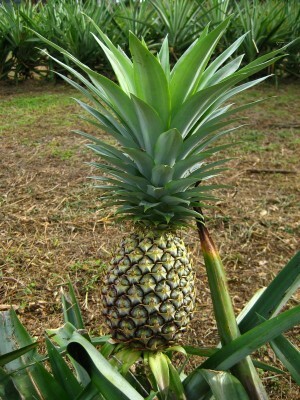 We can’t wait to go home and try to cook it ourselves. I thought having only 3 hours of electricity would be bothersome, but we actually shut off the lights before the power went out at 9pm. I was exhausted and the warm air was so relaxing after the freezing nights in New Zealand. As much as we enjoyed New Zealand, nothing compares to being in a tropical climate. June 7, 2010, filed under New Zealand; 2 Comments. There are lots of bubbling mud pits in and around Rotorura, but I think the coolest place to see mud boil is at the Wai O Tapu Mud Pools. 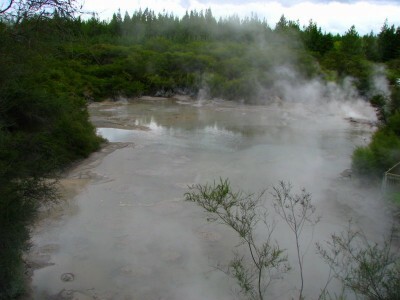 The Wai O Tapu Thermal Wonderland boast sulfur pits, colored pools, boiling mud and a geyser for a $30 admission free, but the mud pools, which are located just north of the park, are free! 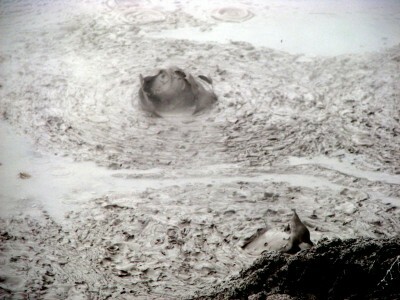 The mud pools is actually one huge pit, not a series of small pools. 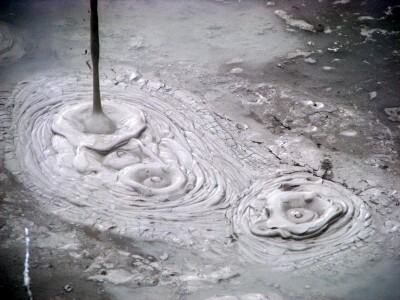 This is what makes it unique from the many other mud pits in the area. The area smells, just like the rest of Rotorura, but it doesn’t have the horribly inescapable stench of the Wonderland Park. The pit is located just a few feet from the car park and there is a short boardwalk that runs along one side of mud pond. The pictures just don’t do this place justice. As soon as you step to the side of pit you can hear the mud boilings and splashing. If you are in the area, definitely check out the Wai O Tapu Mud Pools! June 5, 2010, filed under New Zealand; No Comments. 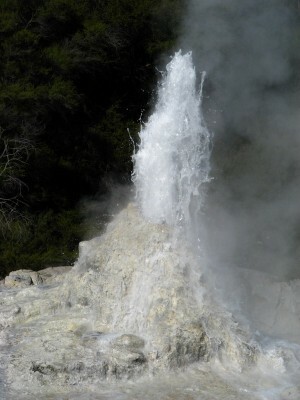 I wasn’t a big fan of the Wai O Tapu Thermal Wonderland because the sulfur smell made me sick, but the Lady Knox Geyser is really cool. We almost didn’t go to this attraction because after getting sick at the park I was afraid to go back to the area. I love the bubbling mud in the thermal areas, but if there isn’t a lot of open space to allow fresh air I just can’t handle it. Luckily we had to go back to Rotorura to deliver our kayak to the Trademe auction winner, so we decided to stop by the Lady Knox Geyser on the way up. Admission to the geyser is included when you purchase a ticket to the Thermal Wonderland and they give you a separate ticket so you can see the geyser on another day. We had bought the ticket a month before visiting the geyser and they still accepted it. 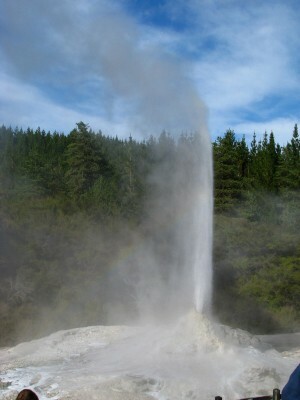 The geyser erupts at 10:15 every day, but unlike Old Faithful it isn’t a perfectly timed natural occurrence. The geyser is natural and would erupt without human intervention, but the park gives it a little push so it erupts like clockwork. 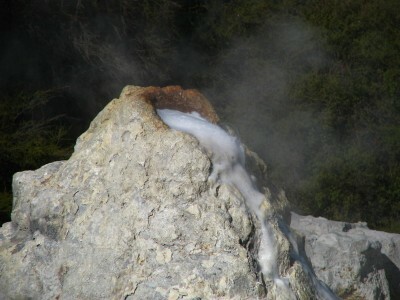 To make the geyser explode a park attendant adds a little bit of soap to break the surface tension which causes the water to boil. I’ve actually seen this happen at home with a pot of boiling water. If you sprinkle salt into a pot that has been resting on heat at just the right moment you will see it boil as soon as the salt touches the water. I’m not going to go into the science behind this – I have vague memories of learning the ‘why’ in my high school physics class. They explain the reaction at the geyser or you can Google it. 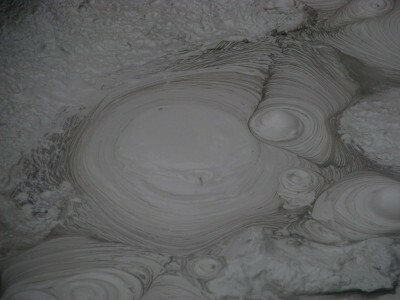 It was really interesting how the geyser was discovered. The area was part of a prison yard and the prisoners would use the hot pool to wash their clothes. One day when a man dumped some soap into the pit it exploded! You can imagine the scene: a dozen half naked guys sitting around a small hole when water and clothes spray everywhere. After everyone dunked for cover and realized it was just a little water not a serious explosion they began to play with the geyser. 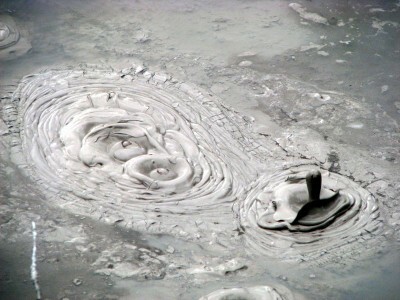 Back then the geyser wasn’t built up to look like a volcano and had a much shorter spray of water. They hauled rocks to the edge of the pool and over time the sulfur and minerals in the water formed the volcano mouth you see now. The eruption lasts for several minutes, so if you are standing around the edge you can walk around to get pictures from different angles. If you are on the first few rows, be prepared to get wet!